1. 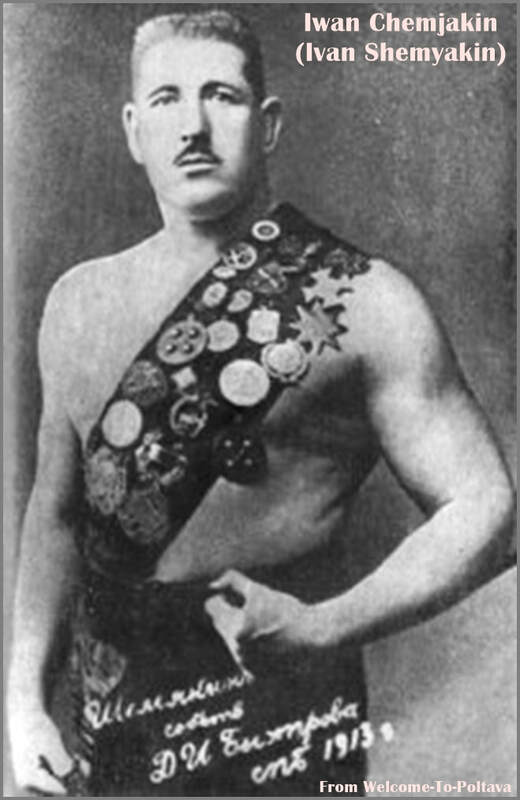 Nicolai Petroff (Gold Medal). 2. Abs II (John Pohl; Silver Medal). The date of this tournament on the old Russian calendar was May 3, 1899-May 19, 1899. 2. John Pohl (Abs II). This tournament started in late January. Chemjakin did not place in this tournament. 3. Aimable de la Calmette. This is the opening day of the tournament which finishes on June 20, 1906 at the Central Kursaal. It is an approximate date. 3. Aimable de la Calmette (Ainé). 4. Fritz Müller (“Schleudermüller”; not Fritz Müller Sr.). This is the opening day of the tournament which ends on September 12, 1906. This is the opening day of the tournament which finished on October 31, 1906. This is the closing day of the tournament which started on October 1, 1906. This is the opening day of the tournament which closes on December 6, 1906. This is the start of the tournament which finishes on January 1, 1907. Championship of Romania: Graeco-Roman Tournament - Day ?? This is the closing day of the tournament which started on November 3, 1906. This is the opening day of the tournament which finishes on April 9, 1907. This is the final day of the tournament which started on March 1, 1907. The exact date of the opening show is unknown. Just that it is in April. It seems the 30th day is the final day of the tournament that started on an unknown date in April 1907. This was in early May. 2. Dirk van den Berg. The exact date of the opening day of this tournament is not known. It closes on May 21, 1907. This is the final day of the tournament which started on an unknown date in May. 1. Dirk van den Berg. This is the first day of the tournament which ends on an unknown date in September 1907. This happened in late August 1907. This happened in early September 1907. This is the last day of the tournament which began on August 5, 1907. This tournament started in mid-September. September 25, 1907 is the latest possible date for the final show as it was the circus' last day in Bonn. The circus had arrived on September 14, 1907. This tournament finished in late April 1908. This tournament finishes in mid-November 1908. Oskar Schneider was unmasked on the 35th day of the tournament. This tournament took place from late March and lasted 43 days in total. This tournament ended in late July 1909. 2. Kornatzky (Karl Kornatz) & Omer de Bouillon. This tournament lasted for 64 days and finished in mid-January 1910. This tournament finished in early January 1911. This tournament finished in the middle of December 1912. 1. Wachturow, Zaikin & Chemjakin. This tournament lasted 94 days. This tournament started in the middle of March 1913. The tournament lasted around 50 days. 3. Jaan Jaago & Josef Smejkal. 1. Hans Kawan & Iwan Chemjakin [gold belt]. In total this tournament lasted 98 days and finished circa June 15, 1914. It was announced as the "World Championship"
This enformation is from a June 30, 1926 edition of a Hamburg newspaper among other sources. 2. Svyatogor & Alex Järvinen. 3. & 4. Iwan Chemjakin & Ivan Chufistov. This tournament started in late January 1915 and finished in early April 1915 lasting a total of 45 days.